Usually I never like use a title to spoil a clip that I write about on The Johnson Transcript, but this is really is the remarkable selling point here. 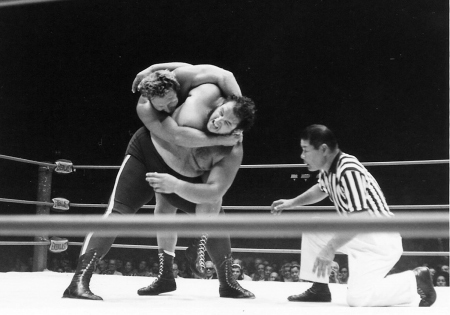 Just about every classic wrestler has used an abdominal stretch at one point or another over the years from the sinister Nick Bockwinkel to the amazing Hulk Hogan to more recent performers like Chris Jericho. 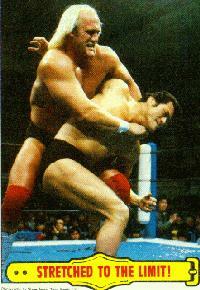 However, you’d be hard pressed to find any of these wrestlers getting an actual submission from that hold. Yet, on April 14, 1961 at his debut for Fred Kohler’s NWA territory in the Chicago International Amphitheatre, Johnny Gilbert achieved this outstanding feat in a mach with “Judo” Jack Terry. By the grace of God (or if you’re an atheist then by the grace of nothing) this match has been fantastically preserved by Chicago Film Archives through the Russ and Sylvia Davis Collection, 1932-1970. Thank goodness it has because otherwise I’d have to spend the rest of my days running around like a madman raving in the hope that someone would believe me. There are no ring introductions for this clip as commentator Russ Davis explains by doing an impression of a country bumpkin, “We just about in time got here to be too late,” and later continues, “I don’t know where we were, at the hot dog stand or something.” Oh, Davis! If only modern commentators could have your terrific dry sense of humor. As for the performers, Johnny Gilbert was the younger of the two. Although he was debuting in that particular building that night, he was still not a particularly young man having wrestled since the late 1940s. Still, compared to “Judo” Jack Terry he was practically a newborn. If Terry was alive today he would be nearing his 101st birthday. As the name implies the Canadian Terry had a background in judo. He also had some background as an amateur wrestler. Gilbert was no slouch either as he had some success as a boxer before becoming a professional wrestler. Gilbert really hams it up from the start of this clip. His first move is to get Terry in the ropes and give him a big shot to the chest. He keeps looking to the Chicago crowd for approval so much that it even seems to annoy Davis who mocks him repeatedly. Think of Gilbert kind of like a 1960’s version of Rob Van Dam. Meanwhile, Davis would be a 1960’s version of…well no one. No one is as awesome as Russ Davis. Despite Terry obviously being the heel Davis talks him up and says, “You don’t get to be this old and this cauliflowered and this used up in a wrestling ring and not know all the tricks and he apparently does.” Terry uses some great psychology by targeting Gilbert’s left arm. Gilbert only gets out of one submission by standing up then knocking Terry down with a big strike. He only executes the offense after looking to the crowd for approval just like RVD would. An interesting tidbit is how Terry sells an Irish whip into the corner, he does it by launching his body face first into the turnbuckles, Bret Hart style. Actually, since Terry was Canadian maybe Bret Hart has been selling that attack Jack Terry style all along. Of course the methods of taking the move are not identical as when Hart did it he merely went into the ropes without turning his back. In Terry’s case he pretty much dives headfirst into the turnbuckle like a madman. There is also a nifty little bit where Gilbert keeps forcing Terry to put him in an electric chair position so he can roll him up and use his legs to attack. This brings the ire of Davis, who complains about the cameramen not being able to get it in shot. Also, Davis had no idea how to call the move (why would he as this was far from common at that time and place). Instead Davis uses some flimflam to explain it that sounds like it came from Dr. Seuss. With the match winding down there is a little bit of unintentional comedy (at least I think it is unintentionally funny). Terry looks so gassed and out of it that he just keeps literally running in circles to avoid Gilbert’s offense. As he is doing this Gilbert just keeps lazily landing shots to Terry’s back. Before clamping on his glorious submission, Gilbert launches Terry into the turnbuckles one more time then delivers two heinous dropkicks. I mean those things are Erik Watts levels of ridiculously ugly. For the finish Gilbert makes up for any of his wrongdoings by forcing Terry to submit to a standard abdominal stretch in the middle of the ring. That’s right, he doesn’t even have to use the ropes for leverage! In the clip it is called a cobra twist. If you look hard enough you can track down some more matches ending this way, but today such a match is as rare as a four leaf clover or a man with three testicles. Okay, maybe more rare than that second example. Still, given the near perfect condition of the clip and its entertainment value I propose that April 14, 1961 be celebrated from here on out in the wrestling community as “Abdominal Stretch Day.” A day when fans can celebrate the day a match once ended with a cobra twist abdominal stretch. For more in the Old School Flashback series featuring some unusual matches from Chicago click here and here. Amazing film quality for a small-time bout. You Are There! Terry (real name Van Audenarde) is only 47 years old in this clip though he looks to be in his 60s. I remember him when I was a kid: unconvincing judo chops, begging for mercy, slow arthritic moves, inevitable loss at the end, my first glimpse of human mortality struggling against the void. I was sorry to see he died fairly young. Must have had a tough life.